The Big One! 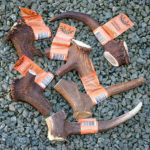 Excellent investment in the top quality deer antler chew you will talk about for weeks, and your dog will still be chewing! Dogs instinctively gnaw and we are confident our latest stock is going to prove to be durable. Your will be impressed with the long lasting results, giving you an opportunity to reward your dog’s devotion with something that will last. Staglers 100% Deer Antler Dog Chew – Jumbo. Sold individually. Impressively over 350g of dense delight! Not all deer antler Jumbo’s are this big! Because they last months they equal great value for money, good news! They say big is best and if you have a really big dog, or a dog you want to keep busy for a long time then this is going to be the answer. If a Rottweiler cannot get through it in 6 weeks then you know that nature has provided the answer! 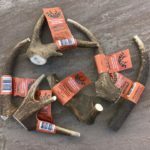 The Staglers Jumbo deer antler dog chew is guaranteed, premium quality antler which is naturally shed from wild deer annually. Your dog will know what to do with their treat. Leave it for him to work out how to enjoy it. Make sure your dog is gnawing on the antler chew and not trying to break it in half. Don’t hold the antler chew for him as this may cause him to bear down on it. Please don’t leave their Stagler outside. Remember, it’s not sticky so put it somewhere safe, where other creatures can get to them, to safeguard your dog’s health. otherwise you dog could fetch it in the morning after slugs have enjoyed it too!